Barça’s new signing Luis Suárez has smashed goalscoring records wherever he has played. He’s known for his astonishing skill, goalscoring instinct and powerful physique, and he just seems to get better and better. He has scored at least ten goals in every season he has played as a professional. Born on January 24, 1987 in Salt (Uruguay), Suárez joined Nacional, Montevideo aged 11 years. He made his first team debut on May 3, 2005, against Junior Barranquilla in the Copa Libertadores. He soon made his mark by scoring 10 goals in 27 matches in the 2006 league season. When he was 19 he was transferred to FC Groningen in Holland, where his 17 goals were enough to attract the attention of Ajax Amsterdam, who signed him for the next season. 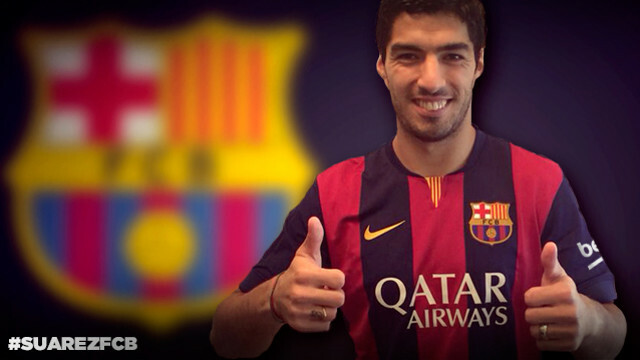 Suárez was in Amsterdam for four seasons, where he scored over 100 goals and eventually became first team captain. He got 17 goals in his first year, and the one after went even better with 22. He was voted Player of the Year on the back of his 35 goals in 2009-10 and also won the European Golden Boot, while also helping Ajax back into the Champions League and also winning the Dutch Cup, although his club failed to conquer the league title. During the 2010 transfer window, he switched to the Premiership and Liverpool, where he scored 4 goals to add to the 7 he’d already scored for Ajax that season. In fact, he scored the winner on his debut for his new club. In 2011-2012, he was Liverpool’s top goalscorer with 11 goals in 31 league matches. Success just didn’t stop flowing for Suárez, for in 2012-2013 he’d be named second best player in the Premier League after scoring 23 goals in 33 appearances. But last season, 2013-2014, was his best yet. He scored 31 goals in 33 games, topping the goalscoring charts in the English championship and winning the Player of the Season award. That also topped the club record of 30 goals by Welshman Ian Rush in 1980/1996, and he also became the first player to score two or more goals in five consecutive matches at Anfield, the first Liverpool player to score three hat tricks against the same team (Norwich) and the first since Robbie Fowler to score 20 or more goals in back-to-back campaigns. He ended the season as joint winner of the European Golden Boot, an honour he shared with Cristiano Ronaldo. With a total of 170 goals in all the leagues he has played in, he is now arriving at Barça with his sights set on creating even more history. Next Next post: Luis Suárez is the 17th Uruguayan to wear the FC Barcelona shirt, but can you remember any of the others?